We came upon these beautiful tiny watermelon-looking things called sanditas at the Union Square Greenmarket. I had never seen them before, but my culinarian son, Mickey, said “oh, yes, I’ve had them at Gramercy Tavern”. Who knew??? 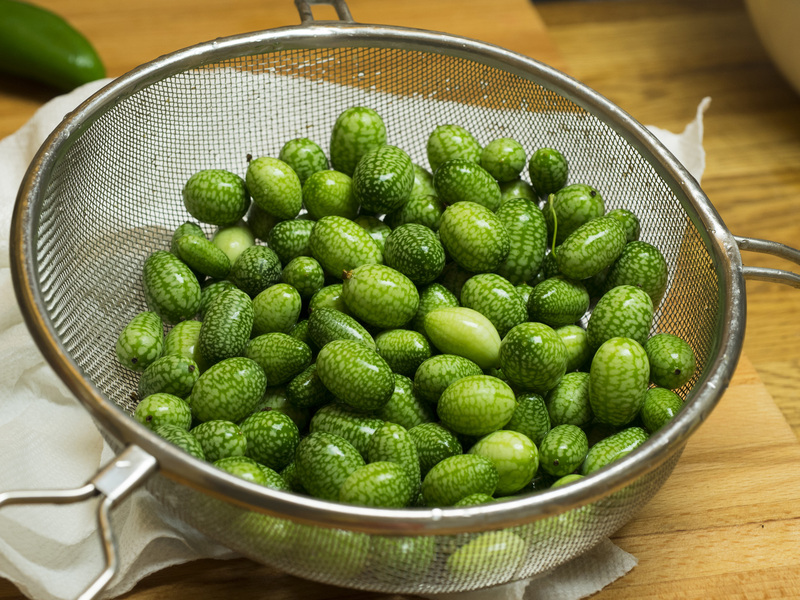 Turns out sanditas are also known as sour Mexican gherkins, cucamelon, or, less-appetizingly, mouse melon and are a favorite Mexican vegetable. When I bought mine, the vendor said “don’t pickle them, eat them”, so, of course, I had to pickle them. 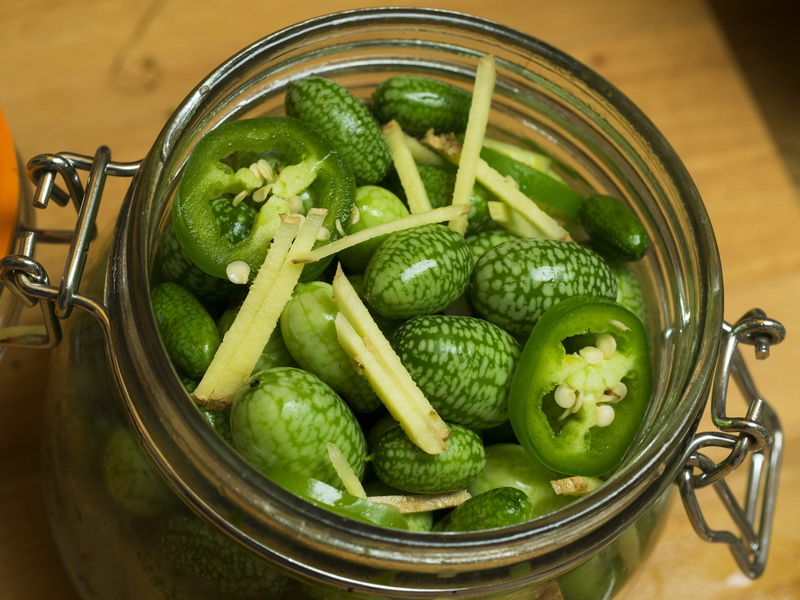 Once I tasted the little guys I was sure that they would work best pickled to serve with patés or on meze platters. I did leave a few to slice in salad, but the remainder went into the following recipe. This recipe can also be used with any baby vegetable or pearl onions. Place sanditas in a glass or ceramic bowl. Sprinkle in salt and add cold water to cover. Let stand in a cool place for 12 hours. Drain off salt water and rinse in colander under cold running water. Drain and dry. Bring the vinegar, orange juice, and sugar to a boil in heavy saucepan over medium heat. Lower the heat and simmer for 10 minutes. While the vinegar mixture is cooking, pack the sanditas, ginger, and chile into hot sterilized jars. Pour the hot pickling syrup over the top, leaving ¼-inch head­space. If you are going to refrigerate the pickles, cap the jars and turn upside-down on a wire rack and let stand until cool before refrigerating. Or, to preserve for a long period of time, place the filled jars into a canning pot fitted with a rack with cold water to cover and place over high heat. Bring to a boil and boil for 10 minutes. Remove from the boiling water and cool as directed for refrigerated pickles. 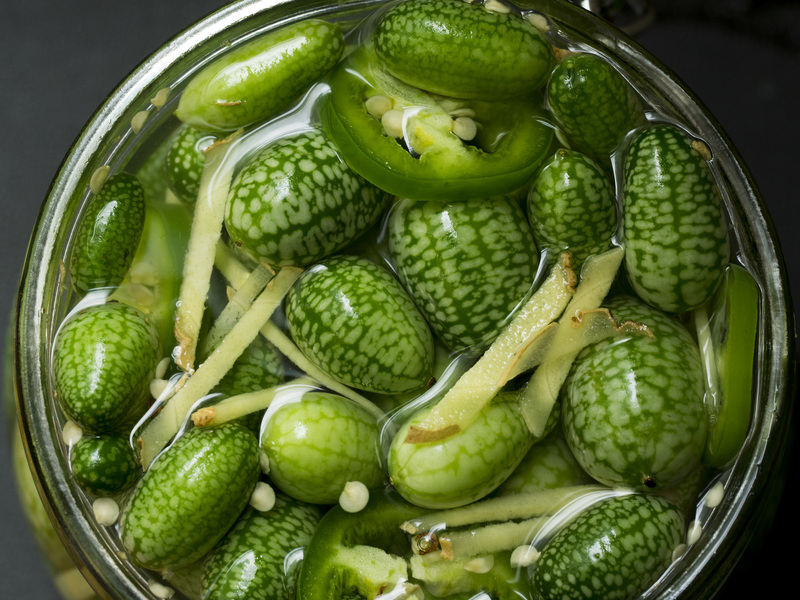 what wonderful photos… the pickles look marvelous! We still have them in the fridge – come on by!